Sleeping Position and Choosing a Pillow: What's Best for Me? The right pillow provides comfortable support, keeping your head, neck and spine in a neutral position all night long. The position you sleep in has direct effects on your health. Sleeping position can affect your respiration, spinal alignment, and even wrinkling of the skin. 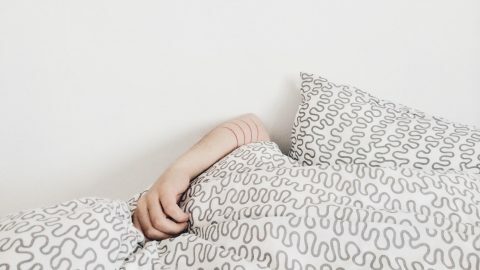 There are proven ways to get a better nights sleep by using the right pillow, with the right amount of fill, and sleeping in the right positions. Knowing how to sleep properly can improve your quality of life. Your sleeping position and pillow work together to provide support for your head, neck and spine. Ideally, your spine is kept in what’s called a neutral position. A neutral sleeping position keeps all the bits and pieces in your back in an ideal posture, preventing unnecessary pressure on your discs, muscles and nerves. Keep your spine neutrally aligned and you’ll avoid discomfort (or worse). Your preferred sleep position will help determine the best type of pillow suited for you. Sleeping on your side with the wrong pillow can interfere with sleep and even lead to serious neck or back pain. Sleeping on one’s side is the most common sleeping position. For most, it’s the instinctive and most comfortable way to sleep. Side sleepers will prefer a high-loft (thicker) pillow. This simply because there is more space to fill between your head and the mattress while on your side vs. other sleep positions. 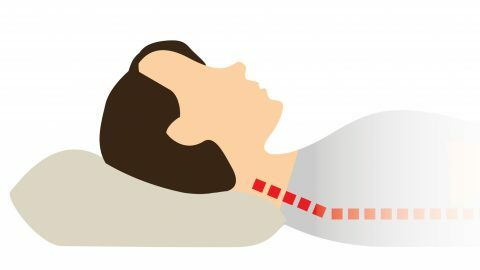 When you lie on your side, your pillow needs to be thick enough to keep your spine straight, but not so thick that it bends your neck out of alignment. Side sleepers will be most comfortable on a firm or extra-firm pillow. A common issue for side sleepers is that their pillow slowly collapses under the weight of their head during the night, becoming too thin. This loss of support will cause your head and neck to bend downwards, resulting in unnecessary strains that can lead to neck or back pain. Folding a pillow in half or using more than one pillow will not compensate for inadequate loft and support. Read More: What Are the Best Pillows for Side Sleepers? Most people are familiar with the discomfort associated with a pillow that is not the correct thickness. Apparently 14% of us are back sleepers. Most sleep experts recommend back sleeping because it encourages better sleeping posture. Your head, neck and back are kept in a consistently neutral and comfortable position while on your back. Back sleepers will prefer thinner low-loft pillows. The best pillow for back sleepers will adequately fill the space between yourself and the mattress, elevating your head only as high as is needed to achieve a neutral position. A pillow that’s too thick will elevate your head too high. As a result, your neck is bent upwards, potentially straining muscles, nerves and discs. Conversely, a pillow that’s too thin will result in an uncomfortable downward bend in your neck. A supportive, malleable pillow will prevent lateral neck twists and strains. 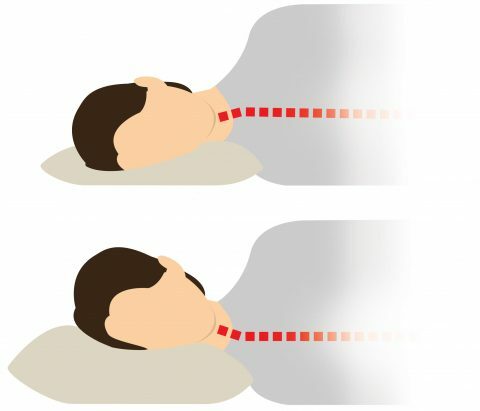 When on your back, gravity will pull your head to your left or right shoulder as you sleep. The ideal back sleeper pillow keeps your head positioned relatively straight, or upright, facing the ceiling. This reduces the lateral twist in your neck. This guy is going to feel it tomorrow! Avoid sleeping on your stomach as it’s difficult to maintain a neutral sleeping position. Sleeping on your stomach forces your head and spine into an unnatural upward bend. Staying in this position for hours on end is not good for your back or neck and can result in significant discomfort and restless sleep. Can’t change your sleeping position? Stomach sleepers will prefer low-loft pillows. Stomach sleepers need considerably less fill in their pillow than someone who sleeps on their side or back. If you sleep on your stomach with a pillow that’s too thick (most traditional pillows are), your spine will bent at an angle which is more likely to cause aches, pains, or numbness. A breathable pillow type that doesn’t retain heat will help to keep stomach sleepers cool. Being that your exhaled breath is directed downward toward your pillow, it’s helpful to use a pillow type that doesn’t retain heat. Most traditional pillow fill can get pretty toasty if you’re blowing hot air into it all night. Read More: Sleeping on Your Stomach: Make the Most of It! It may seem impossible to control the position you sleep in since you aren’t aware while sleeping. If you have bad sleep posture, it is feasible to make a change. Good habits can make a considerable difference in the amount and quality of sleep you get. Keep both your head and neck straight, in a neutral position, avoiding any twists and bends in your spine. Use malleable pillows that are capable of conforming to your neck and spine as you change positions throughout the night. How do I find the right pillow? Squeezing products wrapped in plastic at the local store isn’t the way to find the best pillow. Ultimately, it’s preferable to test drive pillows in your own bed. Check the manufacturer’s return policy and make sure that you’re able to try it for at least a week. If it’s not right for you, toss it back in the box and return it. You spend a third of your life with your head resting on a pillow, so a little extra shopping and experimentation is absolutely worth it. I have a recommendation that works well for all sleep positions! In case you haven’t guessed, we are huge fans of buckwheat pillows. Such huge fans that we started manufacturing and selling them ourselves. Their unique hull filling makes them supremely comfortable for all sleeping positions. Buckwheat pillows are extremely effective at providing even and consistent support for you head and neck. The thousands of tiny hulls will perfectly conform to the space between your head and the mattress eliminating potentially pain-causing pressure points in your neck and back. 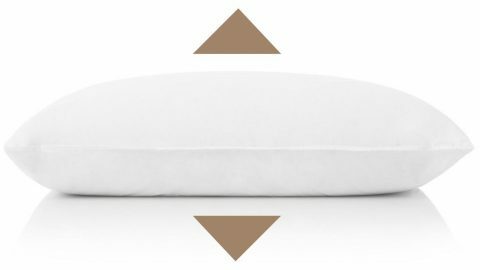 Buckwheat pillows offer firm, consistent support that will keep your head and neck comfortably positioned all night long. High-quality buckwheat pillows always have a zipper. A zipper enables adjustment of the amount of filling in the pillow. As a result, you’re able to dial-in the thickness of your pillow so that it’s just right for you. Simply add or remove the buckwheat hull filling. The irregular and hollow shape of buckwheat hulls creates airspace within your pillow. 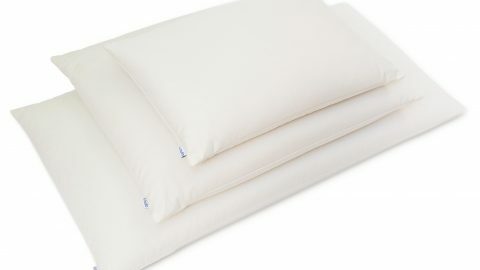 Its breathable nature results in a cool, dry pillow, that gives you the “cool side of the pillow” effect all night long. Buckwheat pillows are made from natural renewable materials. Many popular pillow types contain polyurethane or polyester foam that can emit toxins and carcinogens that aren’t good for you or our environment. There’s no sense in risking your health or filling our landfills with potentially toxic waste! Moreover, buckwheat crops benefit little from chemical fertilizers. It is free of many of the contaminants that are present in other crop types and is safe for your family and the environment. The hulls are compostable, which helps to reduce unnecessary waste in our landfills. It also keeps our soil healthy and nutrient rich for future generations. Finally, buckwheat pillows contain no animal products for those interested in a vegan lifestyle. Sleep on a Hullo for 60 nights. If you don’t care for it, just ship it back to us and we’ll refund the purchase price. Don’t take my word for it, read our customers’ reviews. Try a Hullo buckwheat pillow for 60 nights. If you're not sleeping better, send it back to us for a full refund. I’m sorry Hannah, but we do not have a showroom in Duluth. Please don’t let that dissuade you! UPS will provide free next day delivery in Duluth. Every purchase includes a 60-day trial, so if you’re not happy with it, ship it back to us for a refund. Would the adjustable pillow still work for me? Generally speaking, you’ll need more loft when on your side than your back. An adjustable pillow is appropriate for someone who changes position. I’d try to find a happy medium: not too thick for back sleeping, but not too thin for side sleeping. Give our buckwheat pillow a try! I am sleeping with pillow/s in my head, if I dont use pillow, I will suffer headache in the next morning, what should I do ?? You need to speak to your doctor about removing the pillow/s from your head. After you get that pillow removed, try a few different positions and pillow types. A little experimentation is often all it takes to find a solution that works for you. Bob, as it happens, we’ve written about water pillows recently. I was unable to detect any cooling or heating ability due to the fact that the water pillow was wrapped in a thick insulating layer. Hi, I’m having trouble with my sleep because I sleep with my hand under my head on the pillow and I wake up with a painful neck and can’t sleep without the arm under my head. I’ve tried a lot of types of pillows including foam but don’t win.